His Excellency Mattar Al Tayer, Chairman of the Board & Executive Director of the Roads & Transport Authority (RTA), announced the master plan for the management of traffic and public transport means spanning the Dubai Metro (Burj Khalifa Station, Financial Center Station, Business Bay Station), public buses, and taxis during the New Year’s celebrations at Burj Khalifa area in order to streamline the traffic flow and ease the mobility of visitors from and to the event venue. 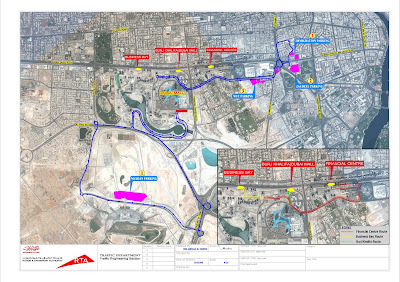 “The plan, which was developed by RTA’s External Events Organization Team in coordination with the General HQ of Dubai Police and Emaar, features the integration of multi-modal transit systems as well as traffic systems to ease the mobility of people from and to Burj Khalifa area. 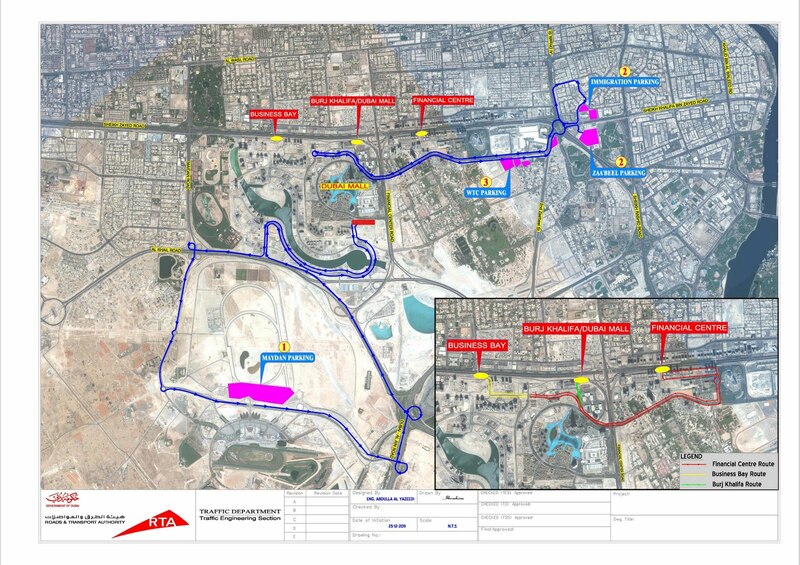 The plan includes expanding the operational hours of the Dubai Metro into a non-stop service past the midnight of Sunday 1st January (24 hours) and slashing the service frequency (headway) to 3 minutes in the stations from Al Rashidiya up to Ibn Battuta during the peak hours from after 12.00 am (past the midnight) and up to 05:30 am, whereas the service frequency during the off-peak time will range from 4 to 10 minutes. The metro service at Burj Khalifa has been enhanced through separating the entry & exit points, improving the operational efficiency of the station, and installing four additional gates as well as modifying two gates in order to ease the public mobility within the station and avoid thronging the station by visitors during this period, besides improving the movement in the Financial Center Station and Business Bay Station,” said “Al Tayer. “The RTA, in coordination with the Dubai World Trade Center and Meydan, has made preparations for utilizing the existing parking space in order to create about 10,000 parking slots and provide access to the venue through express bus service. RTA will deploy 63 articulated, double deck and standard buses to shuttle from the parking lots of Meydan Racecourse, Dubai World Trade Center, General Directorate of Residency & Foreigners Affairs, and Zabeel Park, through a dedicated express lane leading to the events venue. It will also deploy about 4000 taxicabs to work round the clock which are expected to make more than 30,000 trips from and to Burj Khalifa. “The Boulevard Street at Burj Khalifa will be closed once the parking slots are full to avoid potential traffic congestions in the area. RTA will also reset the programmed timing of the key light signals on the Financial Center Street to fit the traffic volumes generated during the peak hours, and deploy makeshift virtual messaging signs on the main roads to alert commuters about the condition of the parking space in Dubai Mall. “Due attention has been made to the maximum capacity of all available transit systems to enable transiting about 400,000 persons to the event site (Burj Khalifa) from 07:00 am up to 12.00 am (after midnight) expected to lift about 260,000 commuters at the Financial Center, Burj Khalifa, and Business Bay stations of Dubai Metro. About 50,000 passengers are expected to be served by public buses from and to the specified parking facilities, 51,000 passengers through the taxicabs, and 50,000 commuters at the Dubai Mall parking space. Departure service from the venue will start at 12.30 am up to 05.30 am and the maximum of transit means will be 263,000 persons, of which 151,000 persons for Dubai Metro, 50,000 persons for public buses, 12,000 persons for taxicabs, and 50,000 persons for commuters using Dubai Mall parking space,” added the Chairman of the Board & Executive Director of the RTA. Al Tayer called on road users and various public transport users to cooperate with the organizers to streamline the traffic & mobility flow as well as the workers at the Dubai Metro Stations to ensure smooth & safe transit mobility. Since established last October, the RTA External Events Organizing Team has drawn up three operational plans; the first was for Gitex where about 2000 parking space were provided for visitors and public transport modes lifted about 326,000 passengers: 157,000 passengers on Dubai Metro up to Al Rashidiya station, 117,000 passengers on board public buses, and 52,000 passengers on taxicabs. The second event was Dubai Air Show where the Team provided 2000 parking space for visitors and public transport modes lifted about 66,000 commuters. The third event was Dubai celebrations of UAE 40th National Day where the Team provided 4000 parking space for visitors and a master plan was drawn to manage the traffic movement and lift visitors. More than 10 directional signs were provided, and public transport means lifted about 42,000 passengers, about 40,000 of whom were served via Al Ghubaiba Metro Station. A delegation from Monitoring & Enforcement Dep't at the Roads & Transport Authority (RTA) ascended to the highest point in the planet represented in the Observation Deck at the 124th floor of Burj Khalifa, as part of RTA's diverse cast of events & festivities held in celebration of the UAE 40th National Day. The delegation was acquainted with all the facilities and services provided by the tower along with its construction phases and number of visitors who popped in. The delegation was accompanied by the CEO of RTA Licensing Agency Ahmed Bahrozyan, Director of Monitoring & Enforcement Ahlam Al-Feel, and a number of officials. Bahrozyan praised the visit as it left a positive impact on the employees who have had a better idea of this mammoth structure the Dubai has managed to build; which is viewed as a towering solid achievement made under the Union that has turned into a UAE landmark and a prime destination of visitors, tourists and residents. Examples of other achievements turned from dream into a concrete reality include the Dubai Metro; which has brought about a quantum shift in the public transport systems. The visitors were familiarized with the latest observation devices on the deck enabling them to have a panoramic view of the Dubai landmarks, key tourist areas and projects still under construction. They were also treated to dazzling shows of the Dancing Fountain beside the skyscraper and gathered all information about it including its length stretching 272 meters spanning an area of more than 12 hectares. The fountain shoots water as high as 150 m into the air (equivalent to a 50-storey building), and has sprinklers that jet about 22 thousand gallons of water into the air as well as glowing lights visible from more than 30 km afar not only on the ground but even from the sky, rendering it the most shining point in the Middle East. The delegation also experienced the various services and stations of the Dubai Metro; which was their basic means of transport during the field visit to Burj Khalifa Station and the event offered an opportunity for staging a number of fun quizzes for employees to test their general knowledge about Burj Khalifa and the Metro. During the visit, the CEO of Licensing Agency honoured the excellent-performing employees of the Department, while they were on the Observation Deck of Burj Khalifa, offering them 'Excellence Cards' in recognition of their dedicated efforts and achievements.